Over the Underworld by Adam Shaughnessy. Algonquin Young Readers, 2016. Paperback 304 pages. 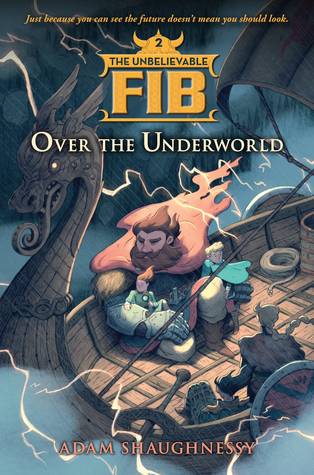 Over the Underworld is book two in The Unbelievable FIB series, and it brings with it just as much excitement and adventure as book one. A little backstory: When I initially received Over the Underworld from Algonquin, I had never heard of The Unbelievable FIB series, so I went over to Goodreads to check it out, and there I discovered that this was actually book two in a series. So I did what any other person who refuses to read books out of order did and set out to my local library (aka placed an interlibrary loan request online and waited for it to be filled because my library is incredibly small and under-stocked) and picked up the first book, The Entirely True Story of the Unbelievable FIB (which I immensely enjoyed it), and was then ready for this ARC! I would definitely advise anyone looking into this series to read the first book, prior to reading this second one; I wouldn't say it's completely crucial, but it will definitely help you understand just about everything. I love middle grade books. I don't read them nearly as much as other books, which is a shame, but I still love them all the same. It never ceases to amaze me how well most are able to entertain both adults and children. Over the Underworld is one of those magical middle grade books that completely fits into that category, and I am excited to share it with the world. Over the Underworld picks up about a year after the first book takes place as Pru and ABE are about to begin seventh grade. Nothing exciting has happened in Middleton since the events of the previous year, and Pru is feeling both angry at Mister Fox for disappearing and bored with the lack of excitement. Although ABE also misses Mister Fox, he is more true to his nature and is mainly just excited for summer to end and school to start back up. Soon enough, however, Odin once again returns to Middleton and brings with him news that the events for Ragnarok - the end of the world - have begun, and thus the children are once again sent off a new adventure mission. Unlike the first book, Over the Underworld focuses less on the town of Middleton and instead takes up more time in new settings, which were exciting to explore. However, as much as I enjoyed this, I felt like there was something missing. I still can't quite place my finger on it, but there was just a little bit of magic missing from this book that was present in the first book. I love how Shaughnessy incorporates Norse mythology into this book, as I am a huge fan of myths and myth-inspired tales. He stays true to the traditional tales, but also adds on his own effects and storylines to make the story flow smoothly and understandably. And just as Shaughnessy does in the first book, he continues to showcase clever, quirky writing and characters that add even more life and effortlessness to the story. Pru is back with her feisty personality intact and eagerness to find an adventure. Shaughnessy does a really good job of showing the three-dimensional traits of Pru; she's a little bit of an accidental troublemaker with a quick temper, but she is also a young girl struggling through some tough times and wants others in her life to understand her. I felt a special connection to Pru because of her loss of her father, and it is probably partly due to this connection that I identified and enjoyed this book so much. Pru lost her father at a young age that is just about the same time that my own father died, and I felt that many of Pru's emotions and questions regarding her father's death were spot-on. One particular instance that struck me was when Pru had to part with a special token of her father's that she constantly carried around with her. I also have a specific item that I constantly wear as sort of token/memory of my father, so when she is anxious and upset about losing it or having to give it away, I completely identified with that. Over the Underworld also featured much more of ABE, who I felt really seemed to develop and show many more sides to his personality throughout the events of the story. We get to see act as a levelheaded partner to Pru's short-tempered manners, as well as a somewhat more emotional side of ABE that lets us understand more about who he is and why he is the way he is. Another thing I really like is the fact that as much as I connect with Pru's character for the reasons mentioned above, my personality is much more like ABE's, and I absolutely fell in love with his slightly awkward manner and penchant for sometimes acting like a 'know-it-all'. As you can probably tell, this book does not shy away from heavier themes such as death, which are present throughout the book in various ways. Shaughnessy excelled at weaving in such difficult themes into such an exciting and fast-paced story, and I highly recommend this to those who enjoy myth-inspired tales and rich, entertaining characters. Though I deeply enjoyed Over the Underworld, it wasn't quite as strong as the first one, and for that reason, along with the many listed above, I am giving this book four stars.